4 days and counting til TDawg’s Back Porch Hootenanny! Well folks, it appears as if the rites of spring are unfolding right in front of us – opening day of the baseball season is here, college football spring practice is here, and TDawg’s Back Porch Hootenanny #16 is this weekend! I don’t know about you, but I am ready for a music explosion and that fresh crisp mountain air that reminds you that spring has indeed arrived! Advance tickets are still on sale through Thursday, April 3, at 11:45pm. After that, you’ll need to purchase at the gate upon arrival at Cherokee Farms. There will be a couple of food vendors there, although you are welcome to bring your own food in. Also, please note this event is BYOB. Y’all this Hootenanny is overflowing with talent, most of it being relatively unknown outside of the region but absolutely as good as it gets. Like all the other Hootenannies, TDawg Presents prides itself on the ability to harvest the up and coming talent to produce an event that is as fresh as it gets, and you come to expect the unexpected. We are thrilled to have Music On Main Street as the sponsor for the Grateful Fred Stage, and Tree Sound Studios will be once again manning the Shed Stage, as they have for every Hoot! Light Show Design will be running the lights for the third consecutive Hootenanny. Please encourage your friends and family to come on out, come on up, come on over, and get yourself ready for quite a ride that’ll leave you grinning from ear to ear by the end! 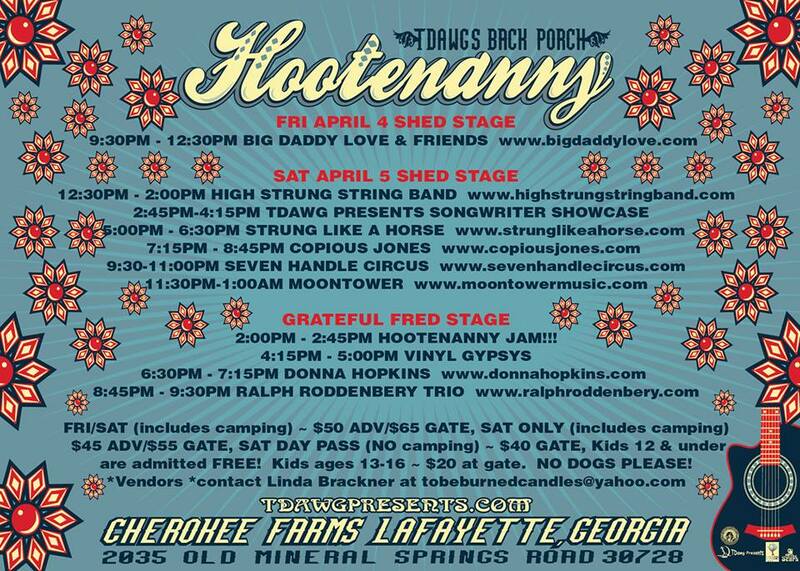 ← Top 10 Reasons Why You Need to Head to TDawg’s Back Porch Hootenanny April 4-5!